Q1. How do the predictor variables play in the model? Q2. Which predictor variables are most important, least important? their contribution to a company's score? to the training dataset used in building the regression model. all observations in the training dataset. Let the means: mean_x = (mean_X1, …, mean_Xk). 3. For a given company, determine its corresponding Score value. For example, for company B433 Score = 0.55. 4. 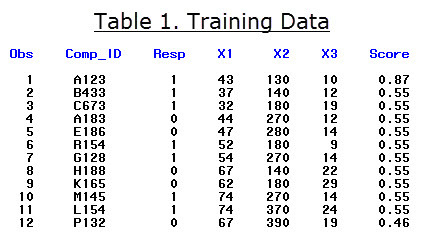 Subset the training data such that Score = 0.55. 5. Calculate the mean of Resp for data_sc55. Mean_Resp is a reestimate (fine-tuning) of Score. Compare mean_Resp = .6 and Score = 0.55. 6. Calculate index = (x - mean_x) / mean_x, for data_sc55. 7. index (deX1, ... , deXk) answers Q1. The raw profile values (of X1, X2, X3) are 37, 140, 12, in Table 1. 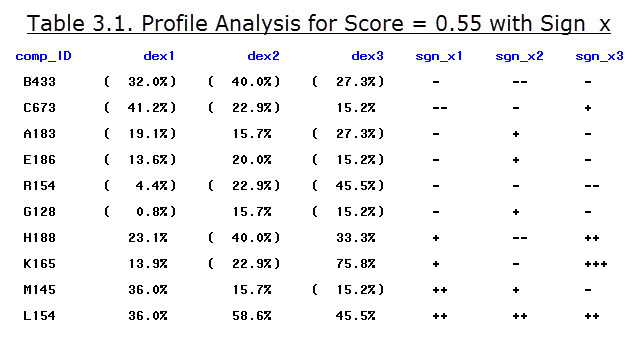 The index profile values are (32.0%), (40.0%), (27.3%), in Table 3.1. The sign profile symbols are -, --, and ---, in Table 3.1. (0, 33.3%), [33.3%, 66.7%), and [66.7%, ...]. 8. Regress Resp on X1, … , Xk. Obtain the standardized regression coefficients. Let the standardized coefficient coef: (zb1, …, zbk). therefore, rendering the model quesetionable, then go to step 8a, below. of X1, X2, ..., Xi-1, Xi+1, ..., Xk. importance weights (see step 10) of the predictor variables. sum_coef = abs(zb1) + … + abs(zbk). 10. pct_coef (pct_X1, ... , pct_Xk) answers Q2. The importance of the predictors are 14.2%, 18.6%, 67.2%, in Table 4. 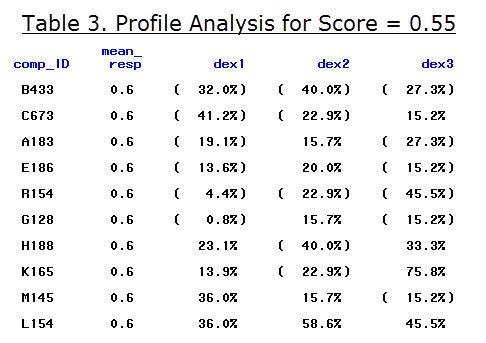 Note: Coef is the same for Comp_IDs within a score group (e.g., Score = 0.55).